Since about 2005 I have been researching one particular branch of my family tree, the Hindmarsh's. Recently someone suggested to me that other people may find what I have found out interesting,especially those who originally came from the same part of Northumberland and so therefore I have created this website. 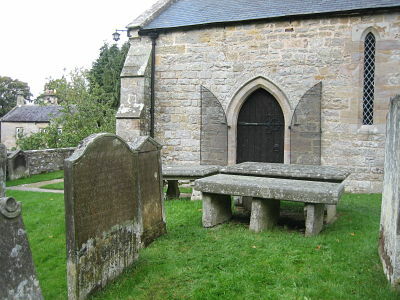 time for the Alwinton Show and met up with Michael the Rector who happily agreed that we could clean the gravestones. So armed with sponges, toothbrushes and a lot of water we went last week to the churchyard and did just that. Being October it wasn't perhaps the best time to be dripping in water whilst we painstakingly washed the lichen away but it was well worth it. Before cleaning, the stones had been difficult to read; so difficult that in 1964, when a register of the stones was made, they had only managed to record the first name on each of the 2 stones ie Percival Hindmarsh of Roukland. "Here lieth Bodies of Percival Hindmarsh of Roukland and his two sons William died April 30th 1748 aged 3 months. James dy'd June ye 1st 1751 aged 5 years. The said Percival dy'd July ye 2nd 1760 aged 66 years Also Hendry his son dy'd Dec ye 5th 1782 aged 23 years Also Eleanor his wife who died Feb 5th 1799 aged 81"
"Joy in memory of Percival Hindmarsh son of Percival Hindmarsh of Rookland who died January 17th 1820 aged 77 years. Also Eleanor his daughter who died march 20th 1820 aged 37 years. Ann Hindmarsh wife of the above died 9th Feb 1837 aged 89 years. 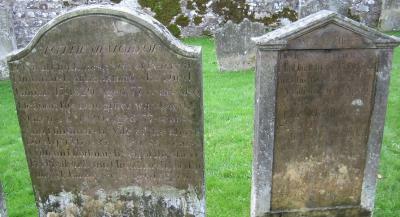 William Hindmarsh son of the above Percival and Ann Hindmarsh died at Alnwick January 8th 1838 aged 58 years." Knowing what the 2 gravestones say, however, is not enough in itself to prove a link and so I ordered copies of their Wills. To see more about their lives and the history look at the Hindmarsh tab. Before the Norman Conquest people did not have family names or surnames in England as most communities were so small the individuals could be identified by a single name. After 1066 AD the feudal system introduced by William the Conqueror split the population into two groups, the nobles who were predominantly of Norman origin and who, in return for land, accepted a liability of military service for themselves and a number of their followers. Most of the nobles had family names, however the serfs tended to just have single names at this time. As populations grew, people started to be known by an additional name which was sometimes where they were from or could be their trade or a personal characteristic. It was not until the reign of Edward II (1307-1327) that the common people generally assumed family names and by then it was considered a disgrace for a gentleman to have one single name. By 1400 most English and Lowland Scottish people had surnames. For example, to distinguish one person from another, a man in a hamlet or village would add the name of the place to his name when signing a document. When looking at the name Hindmarsh we have to consider whether it either developed from a role or occupation, or whether it came from a location. The name Hindmarsh and its variants occurs in many places but no-where with the concentration found in Northumberland. In Northumberland farm hands were called Hinds and would move yearly from farm to farm, normally accompanied by a Bondager, a female servant who would provide domestic duties to the farmer. A Hind could command a much higher rate if he had a Bondager with him. The Hind did not need to be married to the Bondager, she could be his sister. It seems possible therefore that the name Hindmarsh originates from people who worked as Hinds, however I favour the other option. I feel, after looking at my family's history, that their name originates from a place, albeit a place that no longer really exists. In two Border Surveys, that of 1542 and 1604 a Hyndemars Feld or Henmyers or Henmers Well exists on the border of England and Scotland. The 1542 Border Survey refers to hyndemars felde. From kemlespeth to the Almondes rodes and so to the head of Spetehope & from thence to Philpes crosse & so to Rampshepphead and by the blacke rodes to the head of the water of Rede And from ....."
The Border Survey of 1604 contains two references to Henmyers or Henmers Well. Browne Haretlawe, from thence along the High Street to the nuke of the Blaklawe, and from thence along the hedge to Henmers well, all the bordering lands on ye Englishe side are the King Majesties and in ye possession of divers Customarie Tenants whoe use the same as shieldinge grounds. From Henmers Well the bounder extendeth to Slymeie Shanks where Ridsdale and Cubedale meete....."
p84 ".... BOUNDER OF HARBOTTLE MANOR The Bounder beginneth at the East nuke of the Carter, and from thence extendeth eastward upon the higth of the eadge to Robsclughe skore, from whence to Phillips Crosse, soe to the Spiddop nuke, from thence to the Greene Lawe, so to the hight of Browne Hartlawe, and from thence along the High Street to the nooke of the Blacklawe, and from thence to Henmyres Well where Rydsdall and Cubdale meete all which is a Bounder upon Scotlande. From Henmyers Well the bounder extendeth down Sliemy Shanke to the foote of Rowupp fallinge into Cockatte, from thence downe Cockatt to the Hare Haugh to the foot of Kensopp borne fallinge into Cockatt all which is the bounder agaynst Cubedale..."
Where it says "hedge" I believe that to mean "edge". 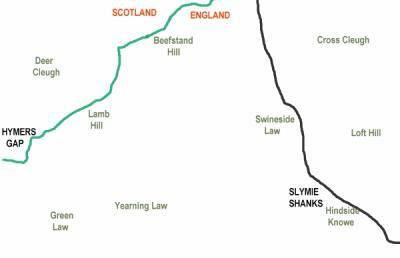 My sketch shows where Hymers Gap is on the Scottish Border and I believe that Henmers Well or Hyndemars Feld is in this region. If you look at the OS map OL16 you will see many features around Hymers Gap called Hindhope etc and it is my belief that the Alwinton Hindmarshes came from this area in the 1600s and settled in the Alwinton area which is less than 10 miles from this part of the Scottish border. The many references to Deer or Hind in this area indicate obviously herds of deer, the other name for which is Hind. The survey of Debateable Lands of 1604 gives details of land-owners and tenants for Harbottle and Elsdon and Hindmarsh is not mentioned. The ten towns of Cubedale are also assessed however less detail is provided of tenants names and so there is nothing in that survey that confirms that Hindmarshes farmed the area at that time. "HINDMARSH is one of the few old families still having representatives in Alnwick. With us the name first appears as Hyndmers in 1483, and Himers in 1633 ; but according to Brockie - " it was originally Hymner and Hymners, and subsequently genteelified into Hindmarsh." Percival Hymners was owner of a burgage in Clayport in 1633 ; and his son, Luke Himers, was admitted into the Tanners' company on October 3rd, 1676 ; and from that time till 1863 there was an unbroken line of tanners of this family in Alnwick. Isabella Hindmarsh, daughter of Wm Hindmarsh, tanner, was born at Alnwick on November 13th, 1798, and educated at the Fulneck Moravian school. At an early age she began to write verses ; but her temperament seems to have been melancholy, for most of her poems are tinged with sombre hues. She died on December 5th, 1823, aged 25 years. A volume of her poems was published at Alnwick in 1818; the longest of them is entitled the Cave of Hoonga, and is founded on a story in Mariners' Tonga Islands. Some of her minor pieces, especially one on Burns, display considerable poetic genius." To read this book please go to Gallery. "Hindmarsh is an ancient name in this county. There was a Walter Hindmers of Mitford in the 13th century ; Hindmers was the name in the 17th century of proprietors in Little Benton, "Wallsend, and Burradon; John Hindmarsh was a Newcastle gentleman two hundred years since ; Edward Hindmarsh held a farm at Nafferton, on the Derwentwater estate, in 1723; Joshua Hindmarsh, constable of Comb Hill, obtained notoriety in opposing the militia laws in the riotous year of 1761 ; the name was in Elsden last century." "Hindmarsh" - English. Dweller at the "Hind" (deer)"Marsh": Old English hind, a hind plus mersc. Swedish - Hind and Moras. The surname Hindmarsh has over time been written many different ways and often even within one persons lifetime their records etc can have many different spellings as the spelling of the name was down to the interpretation of the person who was writing the record down. 15th Century: Hynerssh, Hindmers, Hyndemerche, Hyndemarshe, Hyndemers, de Hindmerse, de Hyndmerrse. 16th Century:	Hyndmers, Hynemers, Hymers, Hyndmarshe, Hynmers, Hyndmer, Hindmarsh, Hyndmarsh, Hindmars, Hindms, Hinmus, Hynmas, Himers, Himners. 17th Century:	Hindmarsh, Hindmarch, Hyndmers, Himers, Hymers, Himmers, Hymars, Himors, Hindmers, Himers. 18th Century:	Hindmarsh, Hindmarch,Heymarsh, Heimarsh, Heymers, Hindmersh, Hymers, Hindmass, Himanes, Himas Himers. 20th Century:	Hindmarsh, Hindmarch, Hymer, Hymes, Hymers, Hymass.